Hi, my name is Doug Bock, and I have been an amateur astronomer since 1965. My interest in astronomy must have started around 1961, because I remember seeing a partial solar eclipse sometime around then. My brother made a pinhole camera so we could see it. I also remember seeing the multiple images of the partially eclipsed sun on the ground being cast through the leaves of the tree in the backyard. I was 7 at the time. A few years later after we moved from the city to the country, I would go over to the neighbors house and look through his 3" f/10 Newtonian reflector telescope, from Edmund Scientific. He was a science teacher from Fraser. He taught me the basics of recognizing constellations and the planets. I'll never forget M13 and Saturn in his telescope. That was in 1965. In 1968, my first telescope was a 60mm Tasco refractor, ( of course ), given to me by a friend of the family. This was also the time that the Apollo program was going strong and my interest in the space program was high. I used to go out in the backyard with my scope and a set of charts from the National Geographic to help me find the planets and some of the basic bright Messier objects. It wasn't until March of 1973 that I found out about the Warren Astronomical Society through the Cranbrook Institute of Science. They got me in contact with Jean Baldwin, the club secretary, and she informed me that a member of the club, Lou Faix lived just 5 miles from my house. I called Lou that day and after some discussion about the club activities, he let me know when and where the next meeting would be. At the meeting I found out the club had an observatory just 4 miles from my house, and they had regular observing sessions there. I decided to join this club. On star party nights, I would ride my bike over to Stargate, which was the name of the WAS's observatory. Those star parties had people like Larry Kalinowski, Ken Wilson ( book fame ), Lou Faix, Frank McCoulough, Peter Kwentus, Dave Harrington showing off pictures, telescopes and observing skills. I learned allot of amateur astronomy that first year in the club. How to build a telescope from mirror to mount, was the first learning experience and the start of my first telescope project. By the end of 1973 I was 17, I owned two 8" Newtonians. An f/7 and an f/9.4. Good deepsky and great planetary scopes. The f/9.4 was put into a folding box, hinged in the middle by two 4" door hinges. The box was made of 1/2" plywood. This worked out great and later would fit into my Chevy Impala. I also started an astronomy club at the Romeo High School that fall. One of the big events I spent about 4 months following and plotting was Comet Kohoutek. While others said it was a fizzle, I enjoyed every chance to observe and plot its course. I also started working on my Messier Certificate. The club would hold Messier contests at the Stargate star parties. These were fun, and highly competitive. This might not be good astronomy, but it did force me to learn the sky. I learned to star-hop to these little fuzzies in preparation for these contests. In 1974 the Warren Club hosted the National Convention of the Astronomical League at MSU. This convention had many different kinds of telescopes, Cold Cameras, and Astro-photography techniques. Lou Faix liked to dabble in this stuff and showed off a cold camera design of his own, with some good results. The convention was a great success. The club was 100 strong and thriving in the fall of '74, when I went to Michigan State U. At MSU I joined the MSU astronomy club for the next 3 years. While I lived in East Lansing, Jordan Marche and I would study until midnight, then check out the sky. If it was clear, we would hop into my car and head north to our observing site, about 20 miles away from Lansing. We would observe from the parking lot of an old church. Many Messier objects bit the dust from that sight. I was hauling around the 8" f/9 at that time. At MSU I was an officer of the MSU astronomy club, and editor of the newsletter, I affectionately called THE OUT OF FOCUS. We also started the Star Bowl contests there, which was an invitation for all astronomy clubs in Michigan, to come and compete. Jordan was in the Planetarium Education program so for the next year or two we would go to planetariums around the Great Lakes area on weekends, to see the shows they presented and visit with some of the staff. In late 1975, I met my future wife, Robin. She had a casual interest in astronomy and was pleased to find someone else with this interest. We hit it off right away, so she became part of the team. We saw Comet West together and went traveling with Jordan and I on those weekend trips. Robin and I also commuted to the Warren, Muskegan, Grand Rapids and Kalamazoo meetings every month. While I was at MSU, I started Astro-photography with the 24" at MSU. I learned how to process various types of film and plates. This carried on through the present. 1977 brought many changes. Robin became my better half, and I took a job at Ford Motor Co. in Dearborn, MI. We started participating in the Warren club quite heavily. It was also the year I received my Messier Certificate ( Dec. 1977 ). We also took trips to the Midland Sunset Club where we met Rik and Dolores Hill. By now I had built Robin a 8" f/6 reflector for her to use. We were also traveling often to conventions around the country. Stellafane, National Conventions, Apollo Rendezvous, GLAS, and Regional Conventions. I also went to Winnepeg, Manitoba for the 1979 Solar Eclipse. This was my first solar eclipse. An amazing trip. In 1981, we went to the first shuttle launch, I became Chairman of the Great Lakes Region of the Astronomical League, and President of the Warren Club for a couple of years. I managed to get the Warren Club incorporated and brought the Great Lakes Regional Convention to Cranbrook where the Warren club sponsored the 1982 Convention. In 1984, we closed on our new home in the country. We also went to Georgia for the 1984 solar eclipse which was Robin's first eclipse. I started building my observatory that fall, with the help of Roger Tanner, Bob Lennox and Ken Kelly. The dedication of the observatory came at the 2nd Annual Summer Solstice Star Party in 1985. I used the mount I built in high school for the 12" f/6. This mount used to hold my 8 inch scopes. But I built it for a 12 inch originally. In 1986 we took a trip to Arizona to visit the sights, family and friends. Oh, and Comet Halley. We spent 3 nights on Kitt Peak with Rik and Dolores Hill. I took many slides of Halley and of the trip itself. I became less active from 1988 thru 1993, due to many other things going on. But, 1994 brought the Solar Eclipse in our backyard. My 3rd. I put the image from the 4" on video so the neighbors and family could watch it in real time. Last fall (1995) I happened along a 20" f/5 for sale, which I made an offer on, and they accepted. Boom. 20" in the garage. And it is restarting the fire for the hobby again. I am looking at objects I have seen 100 times before, with renewed interest. More detail and brightness. I am also discovering for myself many new, dim galaxies, which were out of my reach until now. I kinda feel like I did with that 60mm Tasco for the first time. Hmmmmm. Now we have comets galore flying by and I am back taking Astro Photos again. Contemplating getting a CCD, and had a great time at the Texas Star Party in 1996. Update: 1997: brought many Boon trips, the Nebraska star party, SMURFS, the refurbishing of the second observatory, and the installation of a 10" SCT in that dome. The GLAAC put on the Hale-Bopp Kensington star party. Update: 1998: brought the Total Solar Eclipse in Aruba, the Texas star party, SMURFS, STARFest, and many trips to Boon again this year. Updated the 12.5" with a short tube 80mm scope for a finder, and now have an ST5 CCD camera that we are using for imaging. We've also added encoders to the 12.5" and are working on stepper motor controls for the RA and DEC. I'm having a great time with that and learning a bunch of new things. Also the GLAAC organization is starting to come together, with another Kensington star party this year. The featured speaker was David Levy. Update: May, 1999: I went to the 1999 Texas Star party this year and we had great weather the entire week. But the skies were somewhat brighter than normal. This was talked about at the party. Many people thought the particulate matter was much higher than normal due to the fires in Mexico. It was still quite a trip, with Jack, Clay, Greg, David, Tim, and Bob. We had 6.5 clear nights this trip, and it was a first time for Jack, Tim and Bob. I think they had a great time. Old friends (Bob) and new friends met ( the rest ). I also decided to sell the 20" Obsession, and then bought a used LX200 10" f/10. My interests have moved into imaging over this past year, and the 10" better fits my current passions. Who knows, in a few years I might get another light bucket. But for now, I'm working on getting an imaging system up and running for portable use, and this 10" may just fit those requirements. In addition we've had star parties at Boon, where I take the 10" up for general observing. Update: May 2000: We had a star party in March at Boon, where it cleared for one night. I've done very little except for public star parties. The 10" is fitting well with the public star parties, and I will keep this scope for that purpose. 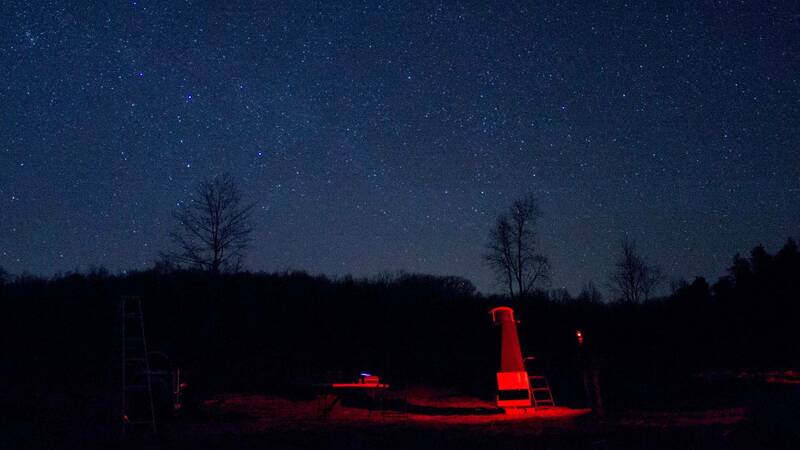 We have a Dozen star parties scheduled this year, so it should be a great astronomy year. Update: January 2001: September and October of last fall brought 10 clear nights of observing on Boon Hill. Also, I have put the 12" back in the rolloff roof, so it is available again for astrophotography, and general observing. Update: January 2010: Some news: 2/3's of the Boonhill land has been sold to other owners. The 2 parcels east of my hill were owned by my brother and sister, and they sold them this past year. So there is just the west 20 acres still owned by myself. I don't know whether we'll keep it or not, but if we do, it will stay with the kids in the future. Currently we do not have a "road" to the hill cut into the the property from the main road, on my piece, and I doubt I will do so, since we haven't had a party there in about 7 years. Haven't been active for 5 years. Many other things to do in life. Attend a few meeting each year, and go to a few star parties. That's all for now. Update: May 2012: I've ordered a 14" f/4.6 motorized Dob. This will become my primary system for now. Had a great time at the Cadillac Spring Star Party. Update: August 2013: The Boon hill property has been cleared in the front acreage to accommodate access. It has wide open North, South and West viewing, with a treeline to the East. I've been doing allot of observing with the 14" this year, in northern Michigan and locally, including in the observatory. This telescope is a joy to use. Update: March 2018: A lot has occurred over the past 5 years. I've built a 24 x 24 building at Boon Hill, as a club house / camping lodge. It allows me to have star parties again there, with electricity and a warm up room. A GSO 10" f/8 RC telescope, a Losamandy G11/Gemini 2 mount, a guide camera (lodestar x 2) and a primary imaging camera (ZWO asi071mc). This is in the observatory (Northern Cross Observatory) in my backyard. I've created a "group" on facebook, for boonhill.net updates/photos and member interactions. I look forward to years of observing with family and friends. "Grab some photons tonight - it'll warm your heart"